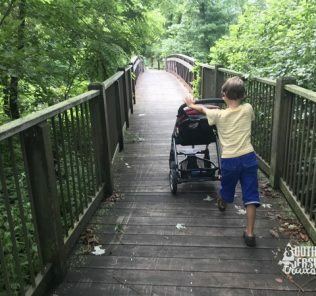 Type: Loop Trail, Out and back, or larger loop by taking the Batona Trail back. Map of Cranberry Trail. For full map, see the link below. 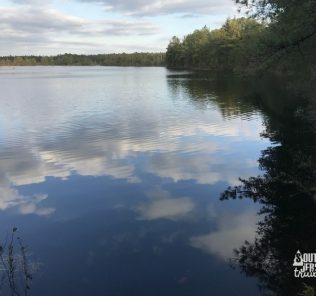 Distance: One way (3 miles) from the Ranger Station to Pakim Pond. 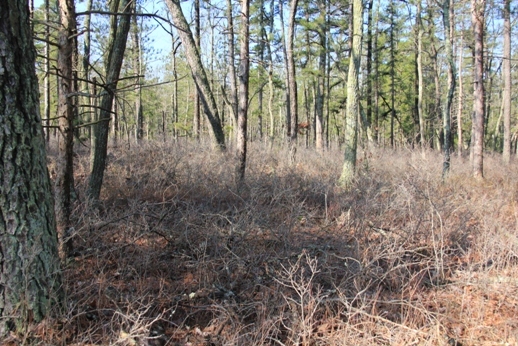 or you can do what we did and make a loop with the Cranberry and Batona Trail (6.7 miles). 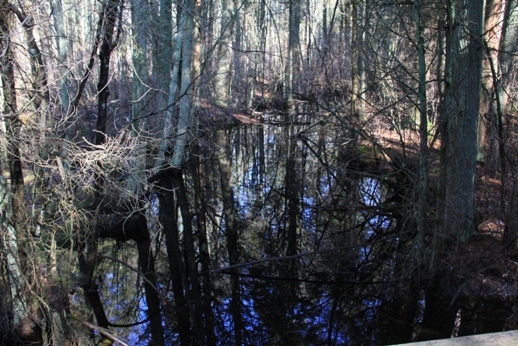 Terrain – Woods, cedar swamps, Pakim Pond. Slight hills on the Batona on the way back. Cranberry Trail is very flat. 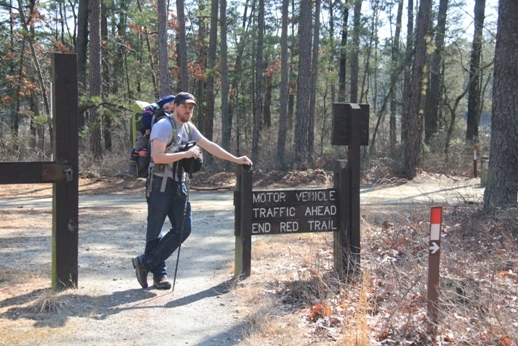 Trailhead – the ranger station parking lot – 39°53’46.70″N, 39°53’46.70″N. The entrance to the park is a mile or two South of Four Mile Circle (aka, the Rt 70 – Rt 72 Circle). 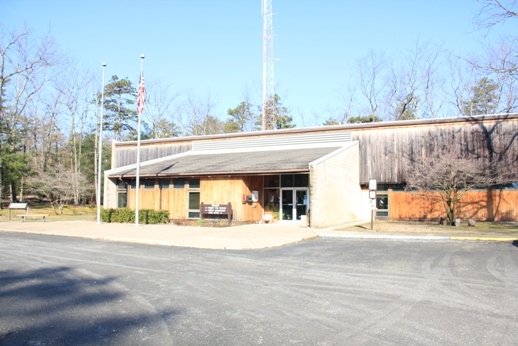 Brendan Byrne State Forest Ranger Station. 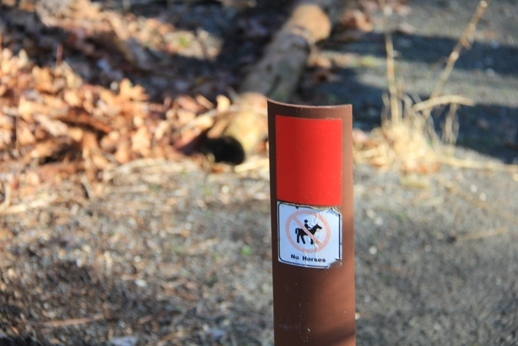 Markings – Red solid – Cranberry Trail. 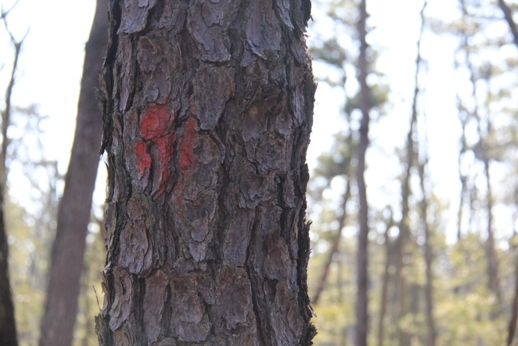 Three red slashes marks the beginning and end of the loop trail (much shorter, only 1.1 miles). 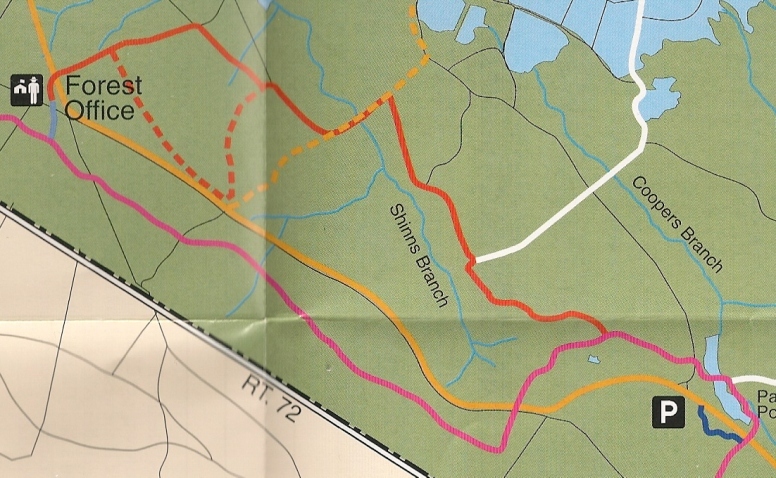 If you choose to take the Batona Trail back (which overlaps with the Cranberry Trail the last half mile or so to Pakim Pond, then splits South on the way back), the Batona has pink markers. 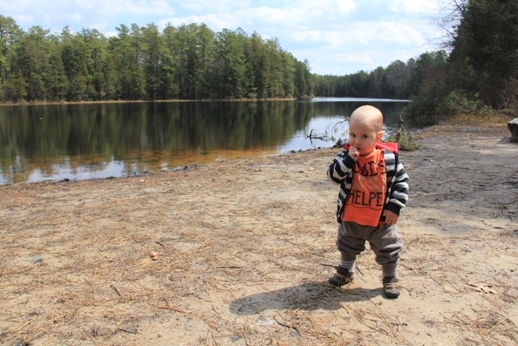 Description: My wife, the baby, and I hiked this yesterday (April 1, 2013) on the recommendation of Jo Ann from a yahoo e-mail group I’ve been on for a long time (how long? Well, it’s a yahoo e-mail group. 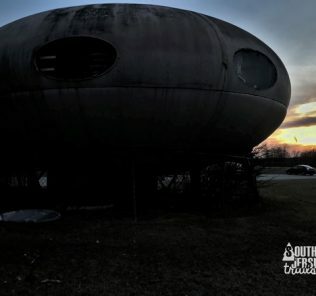 That should give you an idea) – Ghost Towns of Southern NJ. It has a corresponding, much more popular facebook group as well. 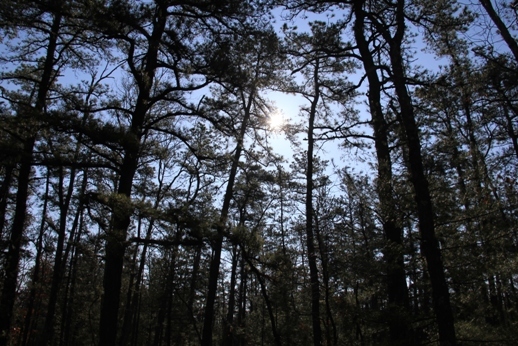 Also also, Jo Ann also has her own blog – Historic Places in South Jersey. I highly recommend you check both of them out. You know, in between taking hikes. Note that I have been paid millions of dollars to endorse these two sites. You know how it is in the South Jersey blogging world. Anyway, the hike! The hike! Duck into the ranger station first (or check out the porch) to pick up a trail map of the park. Inside, they have more information if you need it. If you are facing the front of the building, the trail starts to the right of it. Look for the large sign at the top of this post. This trail is REALLY well marked, there was only one or two spots we weren’t immediately sure which way to go. 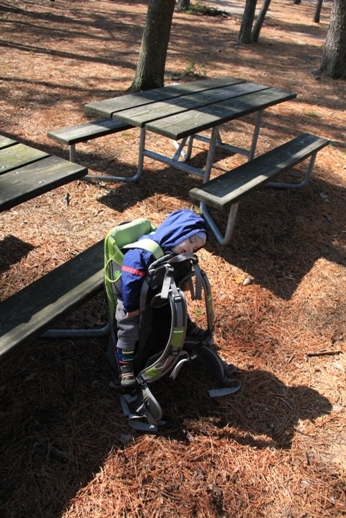 Just lift your head to look for the next marker and you’ll be fine. 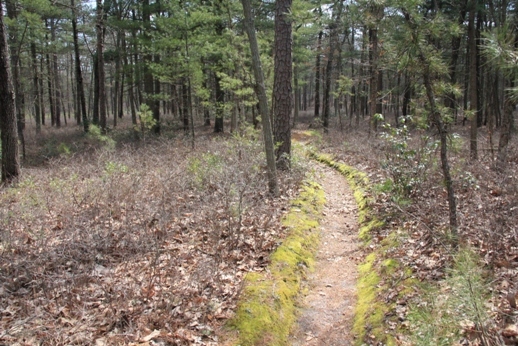 The trail is really wide, you can easily walk two or three folks across without touching the sides. 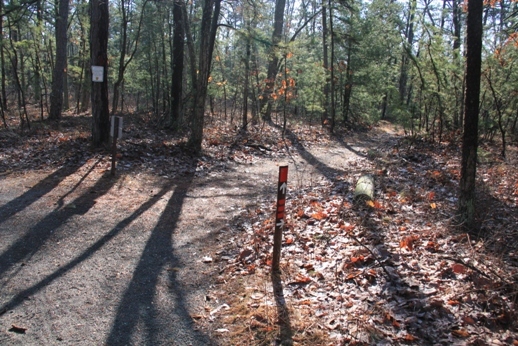 Within a tenth or a mile or two, the Cranberry Loop trail will branch off to the right (marked by three red slashes). 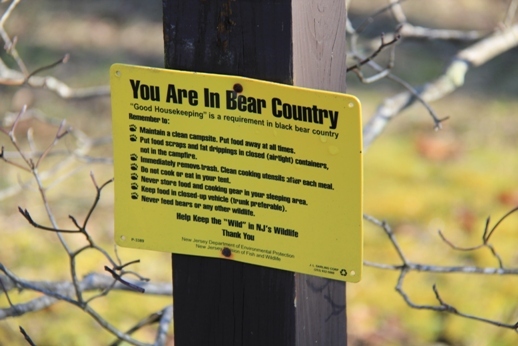 We recommend staying on the main trail, largely because we didn’t do the loop and that may be where the bears are hiding (NOTE: we have no evidence for this claim whatsoever, and are possibly making it up). You’ll hit the other end of this loop and other half mile or so down the trail. 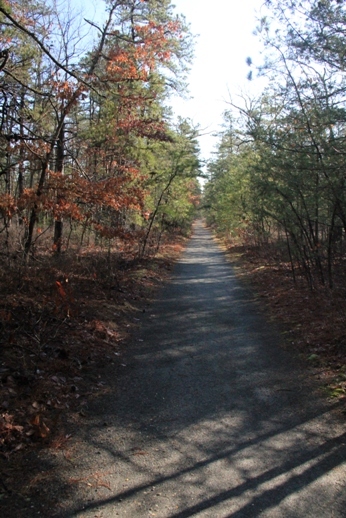 Split between the Cranberry Trail and the Cranberry Loop Trail. 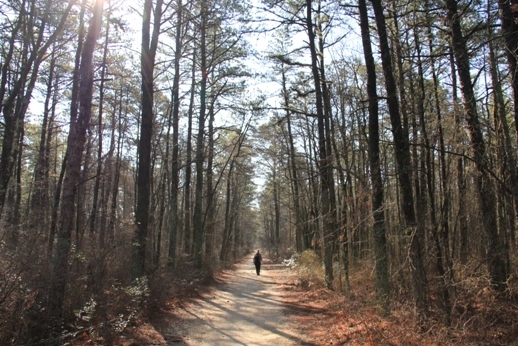 The first mile or so is a nice stroll through the standard pine barrens landscape of pine trees. It’s very pretty. 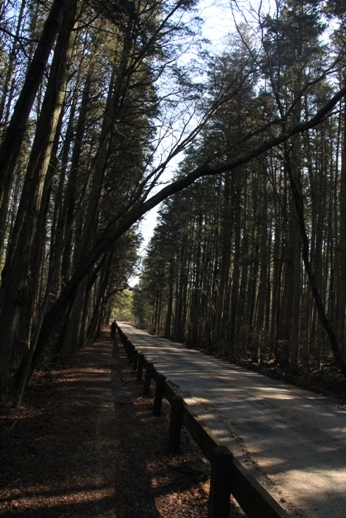 You’ll then hit a road walk (it follows the orange bike trail) across Shinns Branch and through a cedar swamp. 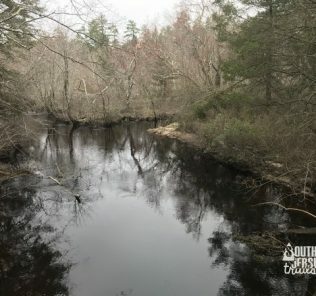 Cedar swamps are my favorite part of the pine barrens. They have tall, ramrod straight trees, a healthy amount of water and muck, and smell really good. This one is one of the better ones that I’ve hiked through, deep and dark. Maybe the bears are in there with snorkels? 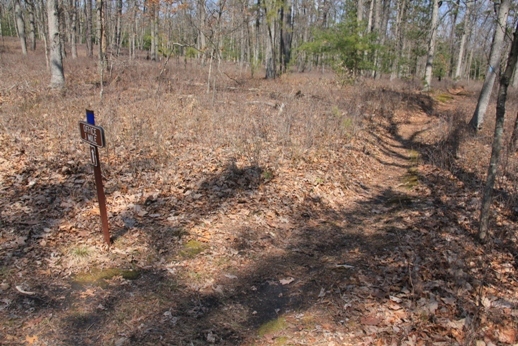 Before you hit three miles, the trail will meet up with the Batona Trail (pink markers), then “end”. This is a fake ending, as there are red markers on the other side of the street. Keep following them until you arrive at Pakim Pond. The Batona will turn left and head around the lake. 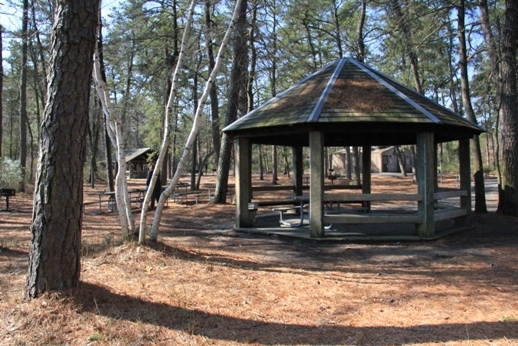 Instead, walk into the picnic area and enjoy your lunch or a snack. 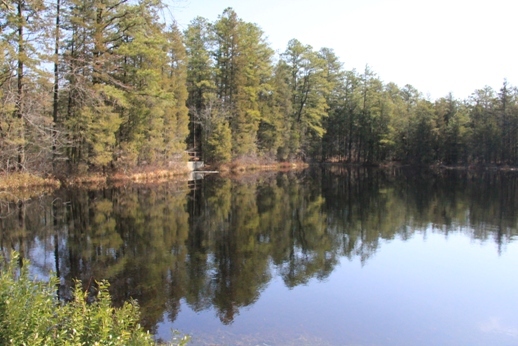 Check out the pond. Maybe even take a nap? Later on, we’re awake and eating an apple. After enjoying lunch, it was time to head back. 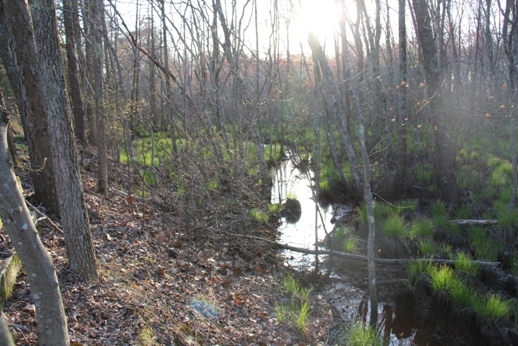 Start back on the Cranberry/Batona Trail. 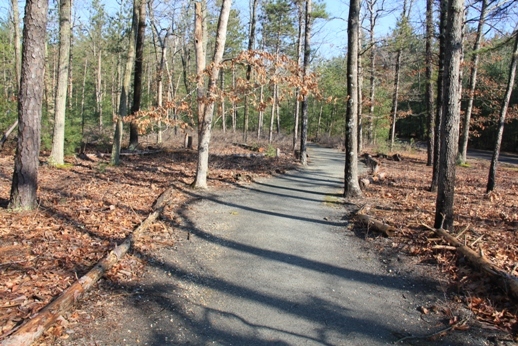 The Batona Trail will split to the left. Take this. The Batona Trail will be explored more in depth in other posts (see also – Batona Trail Carranza Memorial to Apple Pie Hill. For the moment, we’ll compare this stretch to the Cranberry Trail – narrower (usually good for one person only), muddier, and hillier. 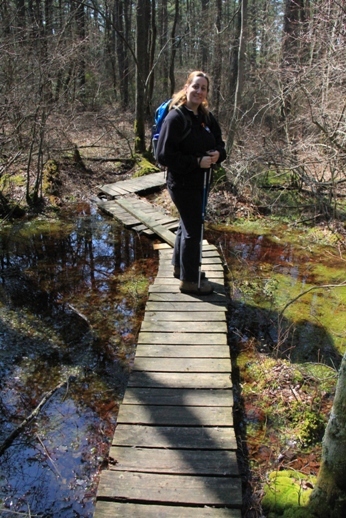 The scenery for the way back is very similar to the first part of the Cranberry Trail – no major highlights, but a pleasant walk through the woods and over a few wet spots. 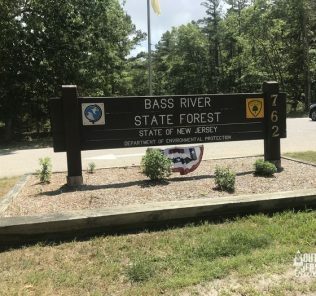 After a bit more than three miles, you’ll see a small blue connector trail that will head 0.1 miles back to the Ranger Station parking lot. This will complete a 6.7 mile loop. Head right for the parking lot. If you have a bit more time, another 1/4 mile or so down the Batona will bring you to the Lebanon Fire Tower. You can check that out, then backtrack to the park office. Love this hike, still one of my favorites years after I did it for the first time.